I read that Tesla are a bit cheaper than existing sources, but if you want to run your house of them you'll need a few units as the maximum current draw is quite low. At home we could probably be drawing 3kw for water heating, 3kw for heat pump, 3kw for oven, plus lights, computer, TV at the same time. That's probably more like 4 Telsa batteries. I like the idea of enough storage for your daily solar output to offset your evening use, plus during outages you'd be laughing. Time shifting power doesn't seem worthwhile yet. Off grid doesn't seem very practical unless it's necessary, but as batteries and solar keep getting cheap they're definitely heading towards mainstream. The number of people registering to reserve a powerwall is curious to me, given the relatively scant information. I don't know whether it is because they're actually not particularly committed to buying one, or whether they're prepared to trust Elon's initial PR without doing their own due-diligence. Which leads to further thoughts about why it's so important to technology companies to report such figures, other than that it sounds good. I was also surprised to hear that the Tesla battery is suppose to be 98% efficient? Obviously it doesn't include the AC > DC > AC losses (round-trip efficiency supposedly > 92%, which is less reported). Both are higher than I was expecting. For just the cost of the batteries, basic back of the envelope maths suggests that using the two models to their maximum* over the 10 year warranty period equals an operating cost [in US dollars] of 11c/KWh (7KWh model) and 67c/KWh (10KWh) [unweighted]. Figuring the true lifetime operating cost would also need to take into account the 2-8% conversion losses, all the financial costs/discounts associated with long term investments and a better idea of the Powerwall's actual product life. Also excluded are the install/inverter costs etc, though these are dependent on the system design (solar vs. no-solar etc). I don't know enough about the particular chemistry of the batteries to know what sort of performance degradation they have over the course of their lifetime, other than what the warranty promises. Then there is the acceptible capacity loss over the life of the batteries, which is normally 20% in datasheets (but Tesla has not specified what they consider acceptable under the warranty). I think these packas are made from the batteries that are not good enough for their car, as in they designed a product to use up the waste batteries. Good idea and I'm not knocking it. I don't think time shifting is economic in NZ at the moment, even on flick electric where you pay the national spot prices. The spot prices are here , basically varying between $0.012/kwh for a few hours around 3am, up to 0.03c/kwh for most of the night, and $0.07c/kwh or a bit more during the day. 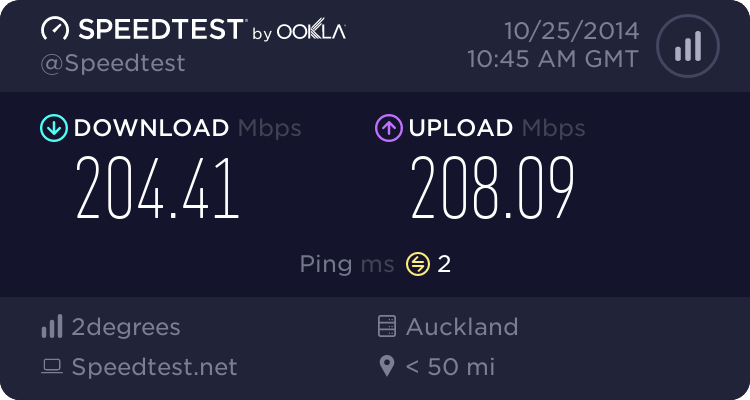 In Wellington a standard users adds on 9.8c, which takes it to between 10c/kwh for a few hours a day and up to 17c/kwh. You'd have to be a pretty high user with a fair number of batteries to make that work, given battery cost. Vector will be a local partner. For most people in NZ this powerwall makes no sense. As a 180L electric hot water cylinder takes about 11kW/hr of electricity to heat fully from cold. (assuming 50deg temp rise) And a 300L cylinder costs approx $500 more than a 180L. So cylinder storage of energy is far far cheaper than battery based storage. And domestic solar in NZ makes little sense from an environmental point of view. As most generation is already renewable. And peak loads are in morning and evening, where there is little or no solar gain. The main use case in NZ will be people who need a large storage capacity UPS system. But in countries like the USA where most power generation is from fossil fuels and nuclear. Any solar systems are a good thing. And AFAIK the USA doesn't have much in the way of load management. So that is where the storage will help. In NZ big emissions reductions could be achieved just by using the existing load management systems properly. timmmay: I read that Tesla are a bit cheaper than existing sources, but if you want to run your house of them you'll need a few units as the maximum current draw is quite low. At home we could probably be drawing 3kw for water heating, 3kw for heat pump, 3kw for oven, plus lights, computer, TV at the same time. That's probably more like 4 Telsa batteries. Timmmay you make a good point, however I don't think the powerwall is targeting everyone. It would be part of the house energy setup. For example if the house had infinity gas hot water, with gas and or a fireplace for heating then the power wall would be used for other mostly low energy appliances such as lighting, TV, computer etc. I don't think the standard city household would go and buy one of these and expect themselves to be "off grid", but rather it would be part of an overall household energy plan. Aredwood: For most people in NZ this powerwall makes no sense. As a 180L electric hot water cylinder takes about 11kW/hr of electricity to heat fully from cold. (assuming 50deg temp rise) And a 300L cylinder costs approx $500 more than a 180L. So cylinder storage of energy is far far cheaper than battery based storage. Vector has now a webpage for people who want to register interest: Vector Telsta Energy Storage. More than 100 cutting-edge Vector solar power and battery systems are being offered free to some of Auckland’s worthy individuals, families, community groups and state and state-integrated schools. Industry leader Vector today launched the Future of Energy campaign which will give free use of 100 Vector solar and battery systems to the public and community groups for 10 years, with another 30 systems going to state and state-integrated schools. “Vector is committed to bringing New Zealanders the future of energy. From smart home systems to electric vehicle charging, we create and source the world’s best technology to help Kiwi families and businesses live and work smarter,” says Vector Chief Executive Simon Mackenzie. “Now we’ve launched our exciting Future of Energy initiative to reward deserving organisations, individuals, families and state and state integrated schools within the AECT area who are doing their bit to energise their local communities. “The combination of Vector Solar panels and Tesla’s Powerwall battery means you can store solar power during the day and cook your dinner with it at night,” says Mackenzie. “Vector is a leader in New Zealand in home energy solutions, including solar and battery storage and we’re delighted to be giving back to the community in this way. The Future of Energy campaign is an opportunity for us, with the support of the AECT, to help ease the burden for 130 worthy groups, individuals, families and state or state integrated schools, while highlighting the many benefits solar power can offer. Auckland Energy Consumer Trust Chair, William Cairns, says Vector’s Future of Energy has been made possible with the support of the AECT via a fund which has historically been used for undergrounding projects in the AECT district and has recently been extended to include new technology such as solar and battery. Future of Energy is open to those living within the AECT district, which covers Auckland, Manukau and the northern parts of Papakura (the old Auckland Electric Power Board area). The competition launches on Monday, 3 August, with the 130 winners to be announced in November. For the first 10 years, Vector will retain ownership of the systems. After 10 years, ownership will pass to each winner. Because of the nature of solar power, winners’ homes and buildings must be suitable for installation. That means they must have a roof facing east through to north-west with a slope between 10 and 45 degrees. Other eligibility conditions are listed on the website. Go to www.vectorfutureofenergy.co.nz for terms and conditions. You have cars with failed battery in say 3 year time. As you know it may be not entire pack which has failed but a fraction of the pack. What would you do with remaining good modules? Right, make the "home storage" box and sell it. Without being able to seee what is remaining capacity of those Li cells in that home storage solution I would assume going forward those could be reused/recycled. Toyota recycles batteries in hybrids. Don't you think Tesla would not find the after use for those from their cars? That is an assumption. I can only be sure when I put it to the test on one of my High Voltage Battery Analysers. "Total primary energy is indigenous production, plus imports, less exports and international transport. Energy supply and demand in New Zealand in 2010 is dominated by hydrocarbon fuels, especially oil, most of which is used for transport." The graph you've posted shows the sources of ALL energy used in NZ, not just energy used for electricity generation which is what we are talking about in this thread. "Approximately 38% of primary energy is from renewable energy sources. Approximately 70% of electricity comes from renewable energy, primarily hydropower and geothermal power. This is expected to increase over the next 20 years, with wind energy making up much of that increase." click on the overview tab, over 50% of the current energy is being produced by renewable sources. That data is no more than 15mins old. 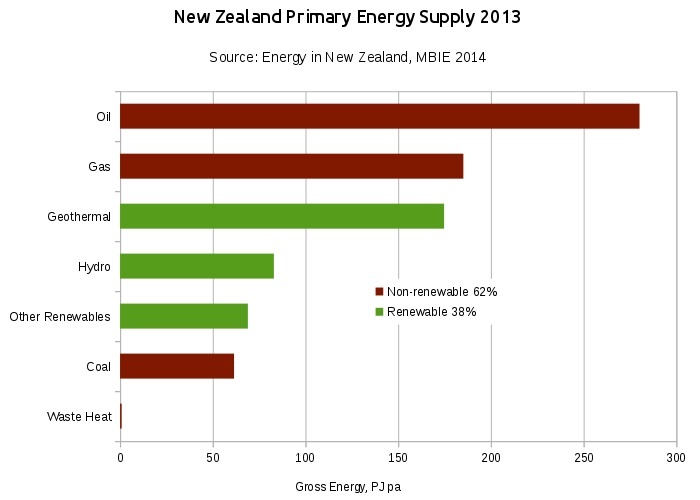 As of March 2015, 75% of New Zealand's Energy was produced via renewable means. Good to see the upward trend, and with more Geothermal coming on line, it should only get better. In our area, Top Energy have applied for consent to triple the output of Ngawha Geothermal Power Station, meaning that the Far North will be a net exporter of electricity to the rest of Northland, thus reducing our dependence on the national grid.